Pearls are widely used in jewelry, is one of the oldest and most beautiful materials. It is good because it requires little or no additional processing. For the carefully selected pearls are typical right, white, black, yellow or pink color and pearly luster. The amazing thing is that these creations of nature are of organic origin. The ancient Greeks sincerely believed that pearl is the frozen tears of mermaids. In Medieval times there existed a legend according to which the shells merciful angels hide the tears of small orphans and those who hurt the innocent. When cooled, the liquid droplets become rounded pearls, is considered a medieval romance. But how does this treasure really is? Pearl is unusual in that is of animal origin. He not formed in the bowels of the planet, like diamonds, sapphires or emeralds. 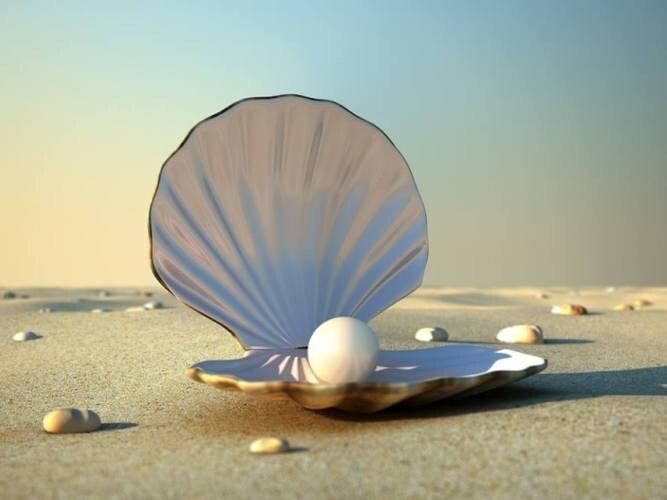 Pearls are formed, grow and develop in shells of bivalves. However, not every shell you can find such a jewel. Why is this happening? It was probably an accident and the ability of the clam to adapt to external threats. Researchers have long found that each pearl appears in a defense mechanism of the mollusk. If the inside of the shell accidentally penetrates a parasite or impurity, for example, a grain of sand, they begin to irritate the mollusk body. He is not able to get rid of the foreign body. Therefore, the mollusk begins to envelop the stranger with many layers of special substances. This process occurs in the same way that the shell formed. If you carefully inspect the sink river or clam, you can see a beautiful shiny sheen. The mantle of the mollusk produces nacre, which forms the inner layer of the shell. This substance becomes the protection of living organism from intruders. Coating the foreign object with layers of nacre, the mollusk will eliminate the threat. A foreign body is securely immured in a brilliant ball, beautifully shimmering in the light. In other words, a foreign inclusion becomes a centre of crystallization and turns into a "fetus" mother-of-pearl bead. However, it happens that the pearl is not formed in contact with the foreign object sink, and around the vial of liquid or gas. The center of crystallization can become a small piece of clam, when part of its tissue for some reason dies. From the shape of "embryo" and its location will depend on the configuration of the future pearl. A foreign object may be located at the surface of the shell. In this case, the pearl will take an irregular shape, and one side of her is not protected by the mother of pearl. If the "pouch" is formed directly in the region of the mantle, the pearl usually gets the correct rounded shape. Such creations of nature differ the highest quality.